Comic Market (Japan), Nico Nico Chokaigi (Japan), Otakon (USA) and other events jointly establish International Otaku Expo Association. We are going to have an assembly at Comiket Special 6 “Otaku Summit” on March 27th at Makuhari, Chiba, Japan. The events following are going to be our original members. 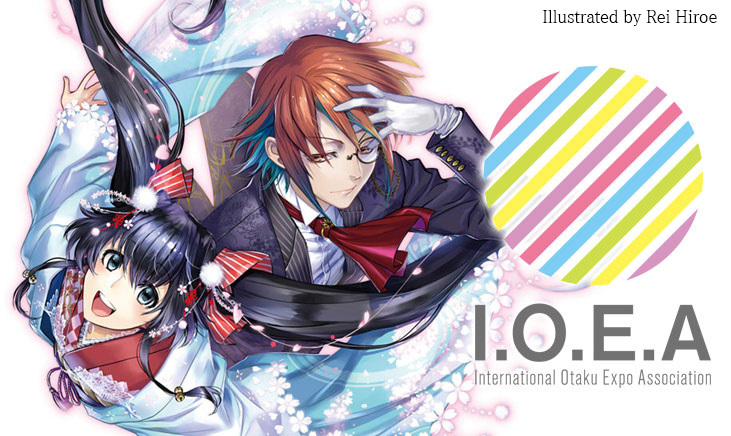 The International Otaku Expo Association (IOEA) is an global association of expos and events where enthusiasts of otaku culture gather together. In the modern world where the Internet connects the world and spreads information and contents, anime or comic fans, or otaku, can be found every part of the world. However, as we can see from the diversity of the otaku events, the otaku culture is developed uniquely in each area. IOEA aims to contribute to develop otaku culture by offering the place where otaku events from all around the world gather and enrich their diversity. Today, friends of otaku culture exist in all corners of the world. Furthermore, the existence of numerous expos that welcome fans of otaku culture is testimony to the prevalence of local fan communities around the globe. Expos with more than 10,000 people attending are quite common, and there are a number otaku expos that boast over 100,000 attendees. Following the footsteps of the Japonism, an artistic movement that centered around France at the end of the 19th century, now a phenomenon that could be referred to as the 2nd Japonism is taking place on a global scale. While this massive surge is taking place on a global scale, each expos and events exist as independent entities in their respective nations and regions, and they do not necessary coordinate with one another. This is so despite the fact these communities and expos are places where people devoted to the same otaku culture congregate. If these communities and expos could place greater effort toward learning about each other, would not be possible for friends who share common goals and values to enhance their mutual understanding of one another? Would not this effort be one that could contribute toward making this world a better place? We believe in such a future. By linking together otaku expos–each and every one testament to otaku culture’s achievements–with one another through the IOEA on a global scale, the fans, creators, organizations, and businesses that gather there would be able to widen the scope of their various activities. Forming such bonds would also enrich friendships, further mutual cooperation and forge deeper understanding of one another, and thereby, not only could help reaffirm respect for each other’s culture, but also would lead to rediscovering diversity and improving mutual trust, all contributing to foster friendship among enthusiasts of otaku culture around the world. The goal of the IOEA is to encourage new developments within the wider otaku culture, and thereby contribute toward making this world a happier place. Numerous otaku expos around the world have agreed to band together in an effort to realize these goals, and today we announce the establishment of the IOEA made possible by following otaku events which comprise the IOEA foundation council–Ani-Com & Games Hong Kong (Hong Kong), Anime Friends (Sao Paulo), Comic Market (Tokyo), NicoNico Chokaigi (Tokyo), Otakon (Baltimore), Romics (Rome), Sakura-Con (Seattle) and Saló del Manga de Barcelona (Barcelona). We are going to have a booth at Comiket Special 6 held on the weekend of March 28th at Makuhari Messe in Chiba prefecture, Japan. The special event OTAKU SUMMIT 2015 is going to take place in Comiket Special 6. IOEA will distribute brochures and introduce our activities at our booth.